Securing summer nanny care in Houston, can be a real challenge, but it does not have to be. 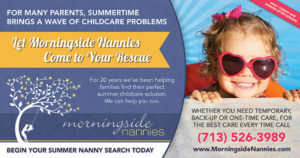 Summer nannies can solve a multitude of problems for working parents. Whether it be driving the children to and from camp or activities, assisting with schoolwork or providing customized and attentive summer care, summer nannies can be the perfect childcare solution for Houston families. Summer nannies work on either a full or part time basis, depending on the family’s needs. This year, summer nannies are expected to hear $16-20 per hour, sometimes more if the candidate is a certified teacher and is required to provide educational services over the summer. This 2018 summer nanny referral rate remains at $1200. If you are seeking a Houston nanny for your family this summer, give our office a call. We’d be glad to help. (713) 526-3989.